Walk the best of the Burren Way on Ireland’s rugged Atlantic west coast exploring the impressive Burren National Park, Cliffs of Moher and the Aran Islands. Take a ferry to Inishmore, one of the Aran Islands and stay in the village of Doolin, Ireland’s traditional music capital. 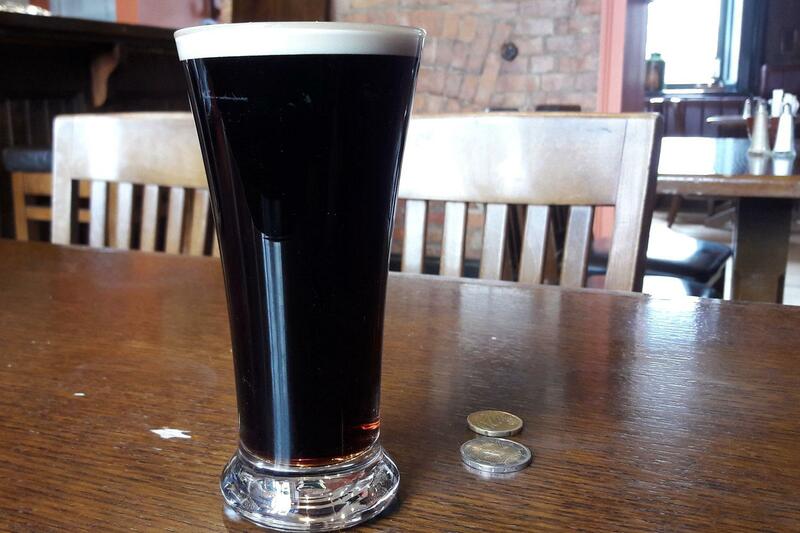 Enjoy a pint of Guinness, the ‘black stuff’, as you listen to the ‘seisiúns’. Traverse the distinctive, moon-like landscapes of The Burren that were created over 330 million years ago and consist of vast limestone pavements. 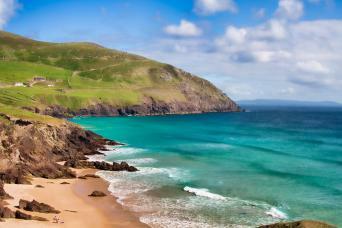 In just a few days you can really get a feel for life on these wild western shores of Ireland. Walking along rural roads and "greenways" there will always be a friendly wave from a local. Nowhere on earth will you feel more welcome than here in the heart of Galway. The village of Liscannor on the Ireland’s west coast is a 2H20 minute bus ride from Shannon Airport and overlooks Liscannor Bay and takes its name from its old castle. “Lis” being Irish for fort and “cannor” a variation of the name Connor. Many of the local buildings, walls and pavements are built from the striking local flagstone called Liscannor Stone. Settle into your small hotel or inn before embarking on your first walk tomorrow. 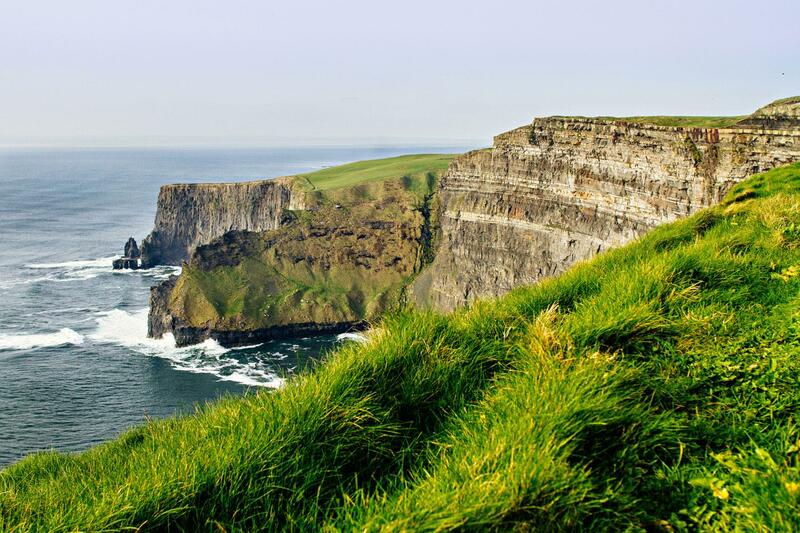 Follow coastal and countryside routes towards the spectacular Cliffs of Moher. Upon reaching these stunning cliffs which are a member of the European Geoparks network, you will be in awe as they rise to a height of over 200m. On a clear day you can see over to the Aran Islands and the waters of Galway Bay and even over to the hills of Connemara. Here there are over 30 species of birds that nest on the cliff faces, including kittiwakes, guillemots, razorbills and even puffins at the right time of year. Be sure to bring your binoculars. Tonight make the most of the fact that Doolin is the traditional music capital of Ireland with music being played in the local pubs almost every night. It will certainly be a highlight of your stay here. Day 3: Visit to Aran Islands. Loop Walk on Inishmore. Today take a ferry (payable locally and takes 1H15) over to Inishmore Island, one of the 3 Aran Islands that have been standing guard over Galway Bay for centuries. The inspiration of many a poet, writer and musician from around the world, Inishmore, the “big island” has a population of approximately 900 people. Your walk initially takes you along a coastal route and past a local seal colony. You then continue along this northern route close to the Stone Age round Fort of Dun Aonghasa. If you wish you can take the short, steep ascent to the fort itself (adding about 1km to today’s walk) and to its spectacular cliff top location. It is now a semi-circle as half of it has been swept into the sea. Then make your way along a rural road/track along the southern trail and back to the village of Kilronan, where the ferry awaits. 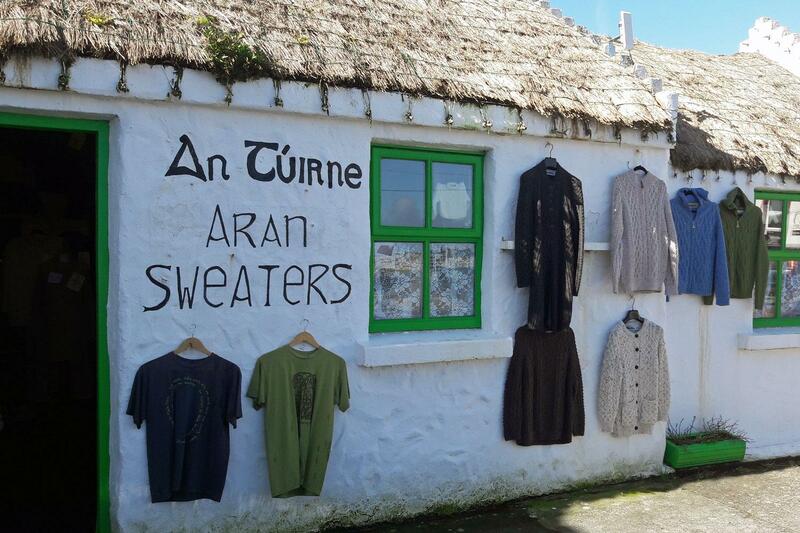 Here why not treat yourself to a traditional Aran jumper. Alternately to shorten your walk you can take a hop on hop off bus close to the fort and walk back to Kilronan from there. 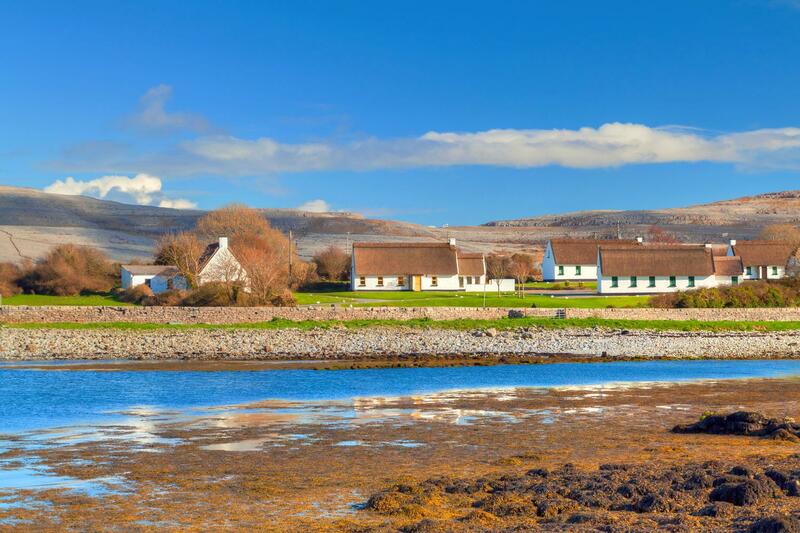 Today you will follow rural Irish roads called “boreens” through quiet farmland with panoramic views over the Aran Islands. 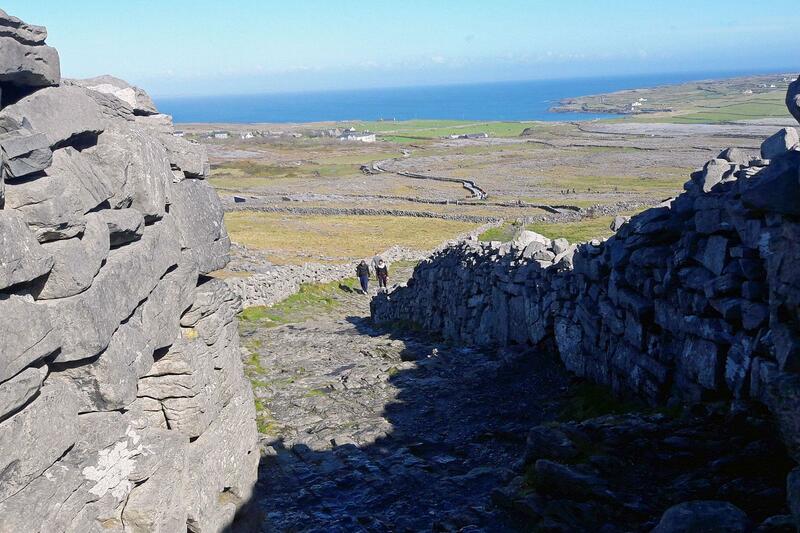 You will also be walking through "The Burren", one of Europe's most distinctive landscapes. It is a vast cracked landscape of karsts or fissures in the rock. Covering an area of 160 square kilometres, it is certainly unique terrain and has a moonscape appearance. Walk into the seaside village of Fanore. It has a fine sandy beach, just 1 pub and the friendliest people you will ever meet. Alternately you will stay in Craggagh a bit further down the coast, which will increase your walk by about 1km. Today you will be walking around the coast and past Blackhead, the most northern part of The Burren. 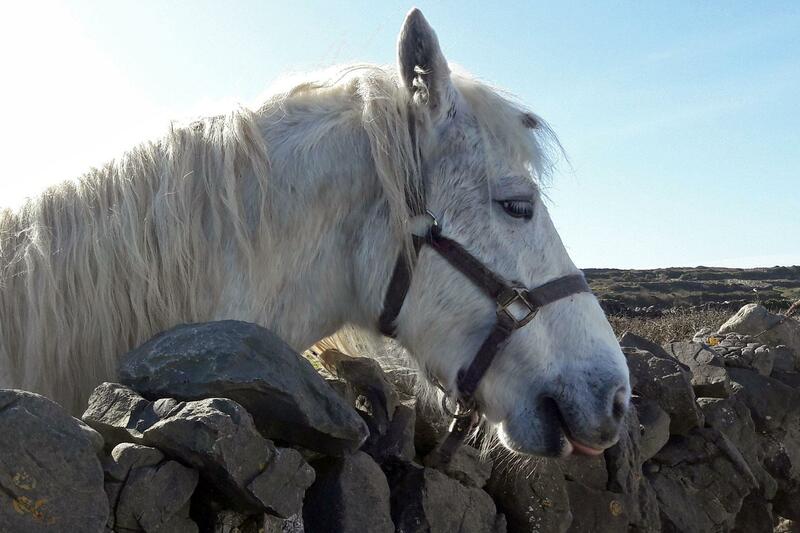 Follow the route along grassy and green paths with fantastic views over the Aran Islands and Connemara. 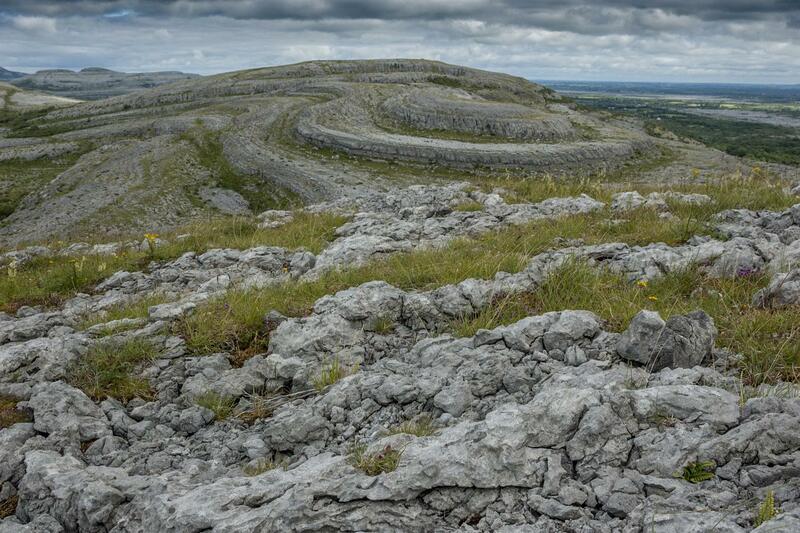 The word 'Burren' is derived from Gaelic meaning 'stoney place'. It is about 200-300 metres above sea level at the north and about 100 metres in the south. Man has settled here since the Stone Age and evidence of this appears all around you, with massive dolmens and stone forts, called cahers. After some rural country road walking arrive in the village of Ballyvaughan. The trailhead for today’s walk is in the village itself and as you walk out of Ballyvaughan there will be panoramic views and the chance to see many wildflowers, ring forts, and a lake. Take a slight detour to Ailwee Cave, one of the oldest caves in Ireland. Its fascinating passages weave for more than 1km and features areas of great geological significance. There are bus connections to Galway from Ballyvaughan (1H). Macs Adventure can also offer a private transfer (extra cost involved). Please ask your Destination & Adventure Specialist for more details. The accommodations on this tour are hand-picked hotels, B&B’s and guest houses. All offer a particularly warm welcome to walkers, traditional hospitality and delicious full Irish breakfasts. The Cliffs of Moher Hotel has very spacious rooms, some of which have a balcony. A full Irish breakfast is provided in its restaurant. 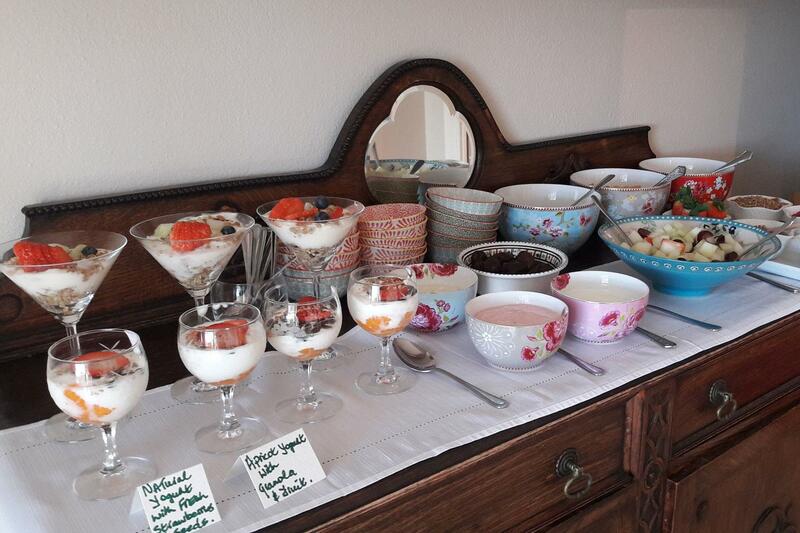 Located in the heart of the picturesque village of Doolin, this family run, 4 star B & B offers you a very memorable breakfast and the six, spacious bedrooms provide you with comfort and wonderful views. Orchid House is a well-insulated, energy efficient home. Guests have a sustainable and eco-friendly environment in which to relax, the rooms are very comfortable and the breakfasts are exceptional. This guesthouse has 11 ensuite bedrooms, all individually and elegantly decorated, and equipped with all modern conveniences. You will receive a very warm welcome. This walking tour is available between mid-April to mid-October. You can start on any date subject to availability. Please note that due to the Open Golf Tournament being held in the Liscannor area from July 3-7th, 2019, it is advisable not to begin your tour during these dates because availability is very restricted. Many of our clients choose to add or remove nights along the walk. For example if you want to simply walk the Burren Way from inn to inn, changing accommodation every night, you can reduce the tour to 5 days by excluding Days 3 (trip to Inishmore) and Day 6 (extra night in Ballyvaughan) Alternately it can also be a longer itinerary of 8 days should you choose to add extra nights in any of the overnight stops. Please contact our team should you wish to add or remove nights along the way. This itinerary is graded moderate and is suitable for regular walkers. However the day when you walk via the Cliffs of Moher is more moderate to strenuous as the path undulates and there are many elevation gains and losses. However on the other walks there is no more than around 300m of elevation gain and loss and often it is less than this.It is important not to stray too close to the edge when walking along the Cliffs of Moher as there are no barriers and it can get very windy, especially if you have vertigo. You will be walking along green roads (old cattle drover’s roads), pathways, forestry tracks and minor tarmac roads. 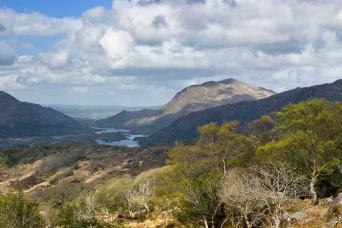 As there are no “public rights of way” in Ireland these itineraries do involve some road walking. Overall there is around 50% of walking on rural roads. However the roads are generally very quiet and pleasant to walk on with great views with always a wave from the locals. At times though you may have to look out for traffic. This route is way-marked but at times the way marking will be a bit intermittent and sometimes we may follow a different route to avoid a busy road, for example. However we provide you with route notes and maps which will help you find your way. You may also use the Macs Adventure App. The ferry from Doolin pier to the Aran Island of Inishmore takes approximately 1H20. For ferry information see Doolin 2 Aran Ferries. There is one ferry per day that leaves at approximately 10:00am. The return ferry leaves Inishmor at approximately 4:00pm. We recommend buying your return ticket (approx €25) on the Doolin2Aran website in advance. Shannon Airport is the most convenient airport to fly in and out of. There are buses available from Shannon Airport to Liscannor (2H25). You can also fly into Dublin Airport and board a Citylink bus to Galway (2H30 to 3H). Buses are available from Galway to Liscannor (2H20). You can also take a train from Galway to Ennis (approx 1H20) and then a bus from Ennis to Liscannor. The following websites have schedules and fares. Bus Eireann and Irish Rail. Another useful website is Citylink. The bus stop is right outside the Cliffs of Moher Hotel and Vaughan’s Anchor Inn, both accommodation options in Liscannor. Ballyvaughan is a one hour bus ride away from Galway. See website links above for information. There are just 2 buses per day to Galway. Once you are in Galway you can take a bus to Shannon Airport (1H40). As mentioned above Galway is also accessible to Dublin Airport (2H30) by Citylink bus. 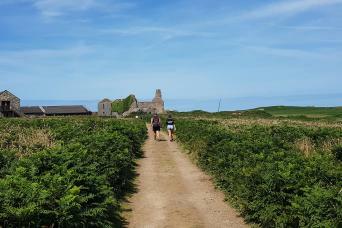 This itinerary is graded moderate and is suitable for regular walkers. 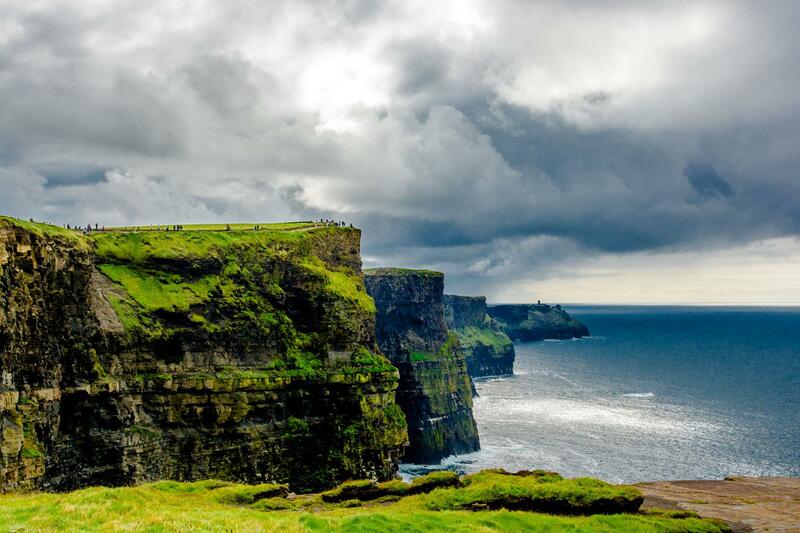 However the day when you walk via the Cliffs of Moher is more moderate to strenuous as the path undulates and there are many elevation gains and losses. However on the other walks there is no more than around 300m of elevation gain and loss and often it is less than this. Never made it to Aran Islands. Weather stopped the boats. Missed that day. Ballyvaughan is too tiny a village. There was no,music available in any pub. Hike from Fanore to Ballyvaughan should be labeled strenuous/ difficult? Was a great trip. I had a fantastic time on this walk! The terrain is varied and beautiful, the towns were very pleasant to visit, the accommodations were great and all-around it was the best part of a great vacation. The directions are very good, and in conjunction with the app, I never felt like I was lost. If you are considering this trip, I highly recommend it, and I will definitely plan trips with Mac's Adventure again in the future. Not as well organized as our Scotland trip. Way markers that would have helped clarify were often not noted, others not clear enough-made a wrong turn that added a lot to a long day, then showed up at B&B where host had been notified that morning that Macs cancelled our reservation there. No info on where we were to go. It got resolved, but the communication to us was not there and it could have been a real problem. One of the b&b hosts was really unfriendly, in the wrong business. Overall though, Ireland still beautiful and so interesting. Would recommend changes to the island trip. Visit the smaller island instead, and take the better boat, the ferry boat took forever and was not a fun ride. Day 1: Arrive Liscannor and overnight. Day 2: Liscannor to Doolin via the Cliffs of Moher, 19 km. Day 3: Visit to the Aran Islands. Walk on Inishmore, 8 or 16km. Day 4: Doolin to Fanore via The Burren, 20 km. Day 5: Fanore to Ballyvaughan via Blackhead headland, 21 km. Day 6: Ballyvaughan Wood Loop Walk via Ailwee Cave, 10 km. If you are looking for a walking tour that offers an extremely warm welcome, musical traditions, places of historical significance, with stunning and distinctive landscapes, then this tour is for you. 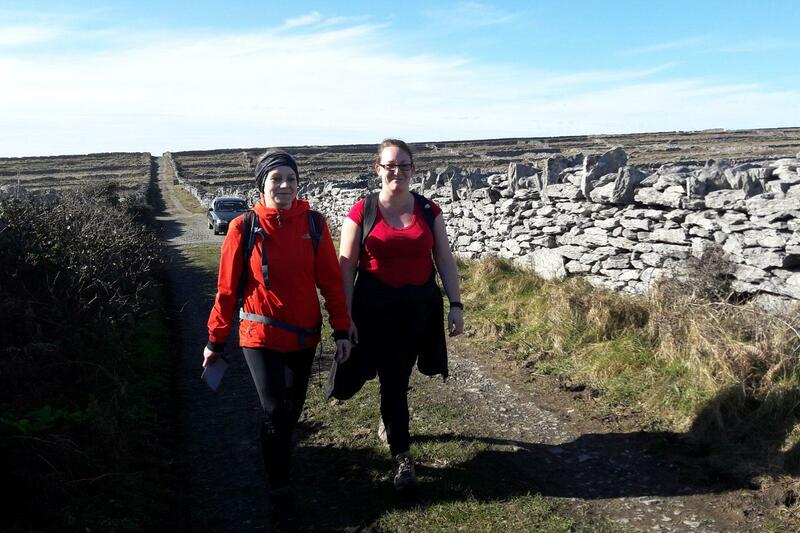 The walks are rated moderate and the trail along the Cliffs of Moher will be your most challenging but worth it for the views over the Aran Islands and Connemara on a clear day.